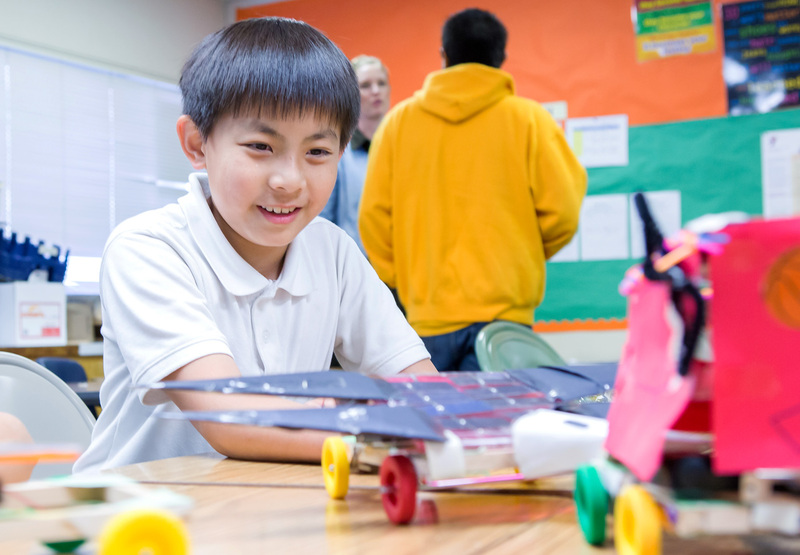 Shiny solar panel disks, rainbows of craft paper and the beaming faces of middle school students make the classroom at Captain Jason M. Dahl Elementary School feel packed with sunshine, despite the rainy afternoon. 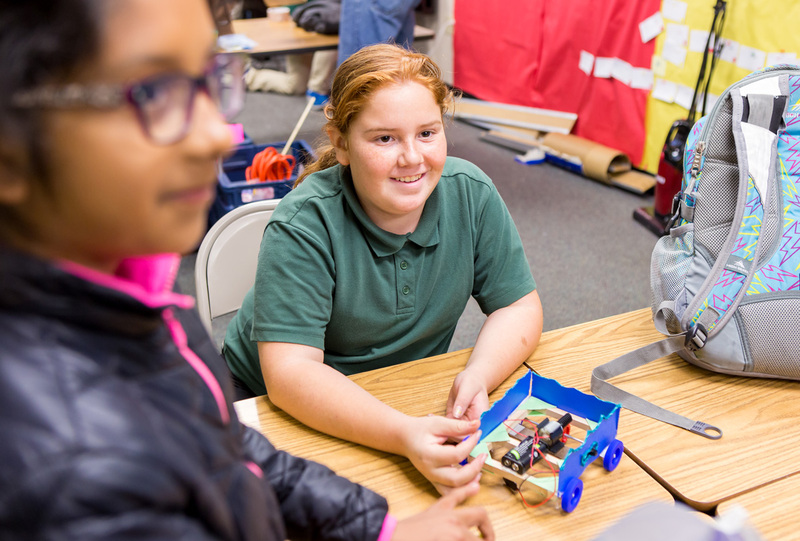 Through an after-school program, run by the SJSU Jay Pinson STEM Education Program, the students at Dahl Elementary have been learning about alternative energy for months, culminating with the construction of solar-powered race cars. Today they are hopped up on competition and creativity, hot glue guns and batteries. A 10-foot-long racetrack, complete with checkered finish line and flag, stretches parallel to the classroom’s white board. It’s race day! 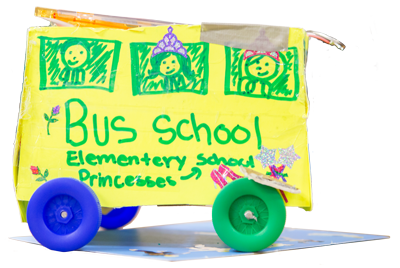 Jay Pinson STEM Education Program Director Virginia Lehmkuhl-Dakhwe and lead student instructor David Macias, ’17 Chemical Engineering, pitch in, helping the fifth-graders put the finishing touches on their built from scratch, custom-decorated cars. One car looks like a school bus; another is modeled after a bird. “My car is going backwards!” a student exclaims as his blue auto reverses across the desktop. 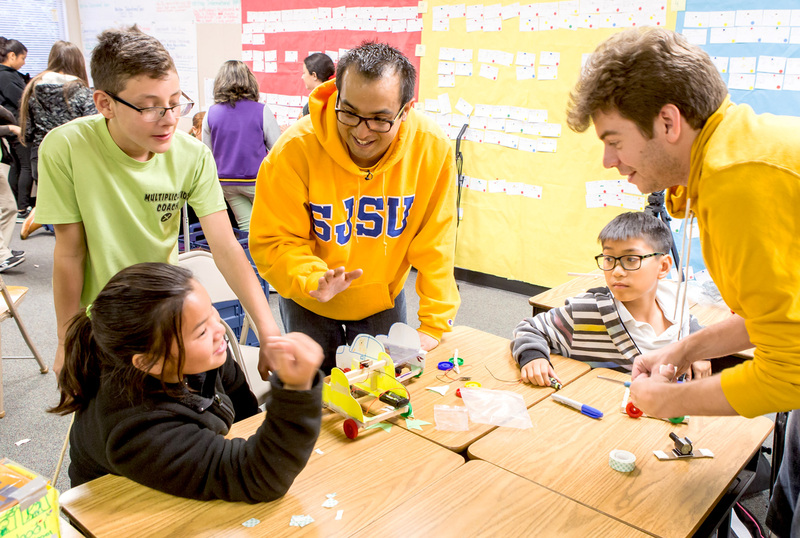 Launched in 2012, the Jay Pinson STEM Education Program was conceived as a cross-campus, interdisciplinary effort involving SJSU’s colleges of education, science and engineering. Its objective: promote the discovery, pursuit and instruction of the subjects of science, technology, engineering and mathematics. Particular importance was placed on offering programs in cybersecurity and computer science to youths from demographics underrepresented in the STEM arena, specifically girls, minorities and those from at-risk communities. It was left to Lehmkuhl-Dakhwe to turn that vision into a reality. With her scientist’s mind and teacher’s heart, Lehmkuhl-Dakhwe talks easily about the importance of STEM education, the massive shortage of qualified STEM college graduates to fill the needs of the nation’s workforce (a projected one million deficit within a decade), and the negative impact that shortage will have on our economic vitality. She talks about the need for innovation, how the highest paying careers in the United States are related to STEM subjects. But she speaks most passionately about the power of STEM to inspire, motivate and focus young students—herself included. As a graduate student studying biology at the Bamfield Marine Station, Lehmkuhl-Dakhwe traveled the world with a small group of other students and graduate advisor/mentor Gary Saunders, scuba diving and collecting hard-to-reach seaweed. “I am who I am because of the time Gary Saunders put into mentoring me,” she says. (Today she still thinks: What would Gary Saunders do in this job?) After three years of the all-lab-all-the-time, globe-trotting lifestyle, Lehmkuhl-Dakhwe settled at Ohio University and earned a doctorate in cancer biology. Prior to coming to SJSU, she coordinated science outreach and taught biology at Columbia College Chicago. Lehmkuhl-Dakhwe and her several lead instructors receive assistance from about 20 service-learning students each semester who support the programs for internship credit through Comm 157, SJSU’s service learning course. This year the program also included two AmeriCorps CSU STEM VISTA members. “Each semester we just get better and better,” says Joan Sirma, ’17 Computer Science, a second-year instructor who has taught cybersecurity in the cybersecurity module and through CyberGirlz, a collaboration with Cal Poly Pomona for middle school girls, at San Jose’s Sylvandale Middle School and Monroe Middle School. “Usually we start our lessons by asking the kids: ‘What do you want to do when you grow up?’ Their answers don’t have to be anything to do with STEM, but we relate them back to STEM. If a student wants to be a fashion designer, we talk about the role STEM plays in that,” Sirma explains. In the cybersecurity module, students learn basic programming and coding through interactive computer programs such as Scratch, where they generate their own animations. After writing a story based on cybersecurity keywords such as “white hat/black hat,” “trojan” or “virus,” students create an animated character and write code to bring it to life. The Jay Pinson STEM Education Program currently reaches several hundred students, grades three through eight, each academic year. Partnerships abound, from local school districts and campus departments to Catholic Charities of Santa Clara County and the YWCA. With community outreach, mentorship and hands-on learning as major aspects of their approach, the program continues to grow and expand. A long-discussed physical home for the program is back on Lehmkuhl-Dakhwe’s radar as they outgrow shared offices in Duncan Hall. Another goal: developing a rigorous STEM teacher professional development program offered in collaboration with the Connie L. Lurie College of Education. Back in the classroom at Dahl Elementary, Macias and Lehmkuhl-Dakhwe announce the first official race of the day. Intel, the Motorola Solutions Foundation, Texas Instruments, Symantec, AT&T, Facebook, SanDisk and Google. “The wings will weigh me down, but the beak will make me go faster,” says Phat Tran, 10, the designer of the bird-mobile. After a last-minute wing removal, Tran squats at the starting line next to competitor Oscar Astorga, an 11-year-old sixth-grader. Macias kicks off the race with a flourish of the checkered flag. Although the bird-mobile loses by a hair—or a feather—Tran still has a smile on his face. Together, he and Astorga pose for a photo. “Say, ‘Alternative energy is the future!’ on three!” calls Lehmkuhl-Dakhwe. Sounds like work for an engineer.